Next week's Coronation Street sees Kate's baby plans hit a snag as Michelle tells Robert she is willing to have a baby with him, and given this is soap, secrets ALWAYS come out and have extremely bad consequences. 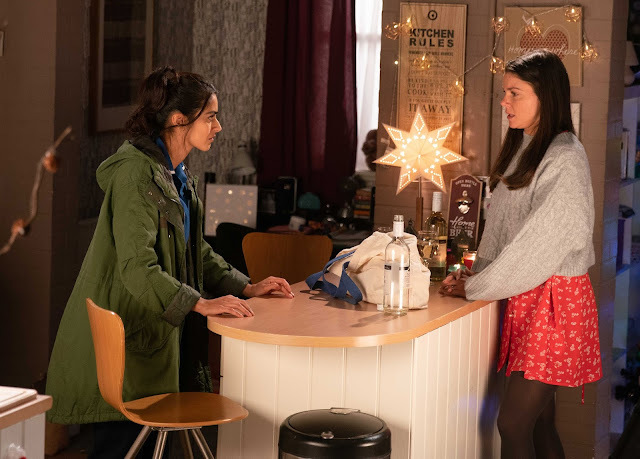 On the 17th December, Kate and Rana have an almighty blazing row as Rana finally admits that she doesn't want a baby at all. 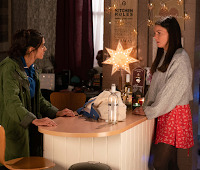 Kate is forced to bite her tongue at the Bistro, where Michelle innocently talks about her plans with Robert to have a baby. Calling into Adam's office, Kate explains her deal with Robert is now off. As Adam cracks open a bottle of scotch and Kate's mind whirling, she looks at him with a new perspective. Fuelled by the alcohol, a determined Kate seduces Adam into kissing her passionately. Adam isn't spared from Rana's wrath though, as on Wednesday she confronts him and is unforgiving. She does though agree to talk to Kate calmly, but Kate is stung when Rana confirms they're over. Johnny then invites Kate to move into the Rovers, and on Wednesday's 2nd episode, Alya calls at Rana's flat to learn she's dumped Kate. Not the Kana Christmas anyone wanted right? Whilst this does all sound completely and utterly terrible, hope is on the horizon as the Metro already revealed that Kate's ex-girlfriend Imogen will be back on the scene to help the two lovebirds reunite, and of course it has already been confirmed that a wedding is on the cards in the future. You can watch the drama unfold from the 17th of December and be sure to check back in with us for our post episode reviews.